Don’t let racism divide us: Take action this Thursday! On Thursday, March 21, the International Day for the Elimination of Racism, Workers’ Action Centre members will join our allies in the Migrant Rights Network to take urgently needed action against the growing tides of xenophobia and racism. Friend, can we count on your participation? From Halifax to Vancouver communities are coming together throughout this week to #UniteAgainstRacism. Here in Toronto we will meet at Nathan Phillips Square on Thursday at 5:30 pm. Please let us know you will be there, and bring a pair of shoes you no longer need in order to represent the experiences of migrants, from crossing borders to working in fields, shops and homes. While we mourn the deaths of 50 Muslims who were murdered in a mass shooting that targeted two mosques in New Zealand last Friday, we recognize that this was not an isolated incident. We must remember that Canada is not immune. 6 Muslims were killed in Quebec City, in another mosque shooting, only two years ago. It was also in 2017 that police reported hate crimes went up by 47% across the country. This is the reality: politics of immigrant-blaming and racism is being fueled in Canada right now. Politicians freeze our wages and make our jobs more precarious, yet turn around and blame immigrants for “stealing” the good jobs we once had. They cut important services like health care and education that our communities rely on, but then point the finger at refugees for over-burdening the social assistance system. There is a continuous push to move our attention away from the harm that the government’s policies have caused, by distracting and dividing us. Yet if we take a look at where the money is, the real source of this harm reveals itself. Between 1998 and 2008 the immigration rate in Canada stayed roughly the same, while CEOs’ wages went up by 70% and average workers’ wages went down by 10%. Also since the 1980s, the wages of the majority of us have either fallen or remained the same while the income of the richest 1% kept rising at alarming rates, according to PressProgress. The wealth in this country is not being spent on migrants and refugees; it is lining the pockets of super rich CEOs. At the Workers’ Action Centre, we know there are too many employers out there violating the rights of low-wage workers, who are largely immigrants and women of colour. Some employers specifically take advantage of migrants because the threat of being deported restricts these workers’ ability to speak out. This has led to the widest wage gap of 72%, with a migrant worker making only 28¢ for every dollar that a white man makes. To add insult to injury, migrants as a group also pay billions of dollars in taxes, in Canada Pension Plan deductions, and to Employment Insurance, yet they are not allowed to access these resources when they are in need. All migrants need and deserve permanent status now so that they can enjoy full rights. When bad bosses exploit migrants, it hurts all of us by keeping employment standards low. To bring decent work to Ontario and the whole country, we have to unite to defend and improve the rights of all workers. While we continue to advocate for good jobs (click to see our policy submission on the dangerous Bill 66), and we are also committed to take a strong stand against the racism that leaks into our laws and also tries to divide us. Please join with us! 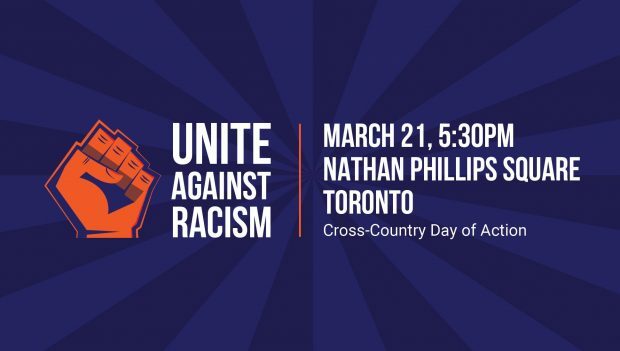 If you are in Toronto, hope to see you at Nathan Phillips Square at 5:30 on Thursday to #UniteAgainstRacism. Visit migrantrights.ca to learn more.